Barcelona is the second-largest city in Spain and one of the most popular tourist destinations in the country. With iconic architecture, a flourishing Michelin star-worthy food scene and a vermouth revival under way, there&apos;s never been a better time to check out the Catalan capital. The streets of Barcelona are lined with breathtaking works of architecture, from Gothic churches to Antoni Gaudi’s surreal buildings, as well as modern sites like Maremagnum Mall. It&apos;s also home to the one of the world’s most beloved soccer teams, Barcelona FC. With its cosmopolitan feel, relaxed pace of life, breathtaking architecture, fantastic gastronomy, and unbeatable climate, it really is the city that has everything. Feast on hearty, rich paella at an outdoor table overlooking the sea or step back to the 1920s at an elegant art nouveau dining room. Barcelona bubbles with life in its narrow Barri Gotic alleys, along the pedestrian boulevard called the Ramblas, in the funky bohemian quarter of El Born, and throughout the chic, grid-planned part of town called the Eixample. Which hostels in Barcelona have private rooms for couples? Hostel One Paralelo is a hostel designed, run and loved by backpackers for backpackers! Even though it is part of a chain, each of their hostels are unique and aim to offer the most comfortable and enjoyable experience to each guest, with great atmosphere, spacious accommodation and the way to any traveller’s heart: free dinners! Join them for delicious daily homemade food, perfect to meet fellow travellers and start the night right! Located at a walking distance to many of the main sights such as La Rambla, Montjuic and the waterfront, they are also next to the super efficient metro, making each and every corner of the city easily accessible. It really is the perfect place to call home whilst you explore the magical city of Barcelona! At Hostel One Paralelo, you will get free WiFi, large private lockers, soft towels and 24h reception and security. Choose between mixed dorms of 2, 4, 6 or 8 beds or private double rooms and make the most of the hostel&apos;s facilities including a laundry service at an extra cost, a fully equipped kitchen accessible 24/7 and three different common areas all designed for different moods: to relax, to work or to party. Explore Barcelona and see some of the city&apos;s hidden gems that most tourists miss with the hostel&apos;s free day activities or join them to some of the city’s coolest bars and some of the biggest clubs in Barcelona to experience the magical city by night. Hostel One Sants has a great atmosphere and is an easy place to meet other people. 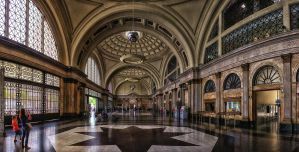 It is an easy 12-minute walk from Sants Station, the main train station in Barcelona. They are also very close to Camp Nou, the football stadium, and Montjuic, Barcelona&apos;s largest mountainous park. They offer a wide range of activities and special events throughout Barcelona, as well as free entrance to the best clubs in the city. Hostel One Sants is not just a hostel. It is a place where you are going to feel the same comfort and liberty as if you were in your own home. From the minute you walk through the doors of Hostel One Sants, you will immediately feel the friendly and positive vibe and atmosphere. The staff looks after each guest with and provides free home-cooked dinner every single night! Not only are they here to feed you after your long day of exploring this beautiful city, Hostel One Sants also wants to make sure you have just as much fun with the hostel and meet as many people as possible. That is why they also organise free day activities and epic bar crawls every night. The property has a beautiful rooftop terrace, large basement area equipped with pool table, reading corner, TV with Netflix and PS3, a reception and communal kitchen opened 24h. 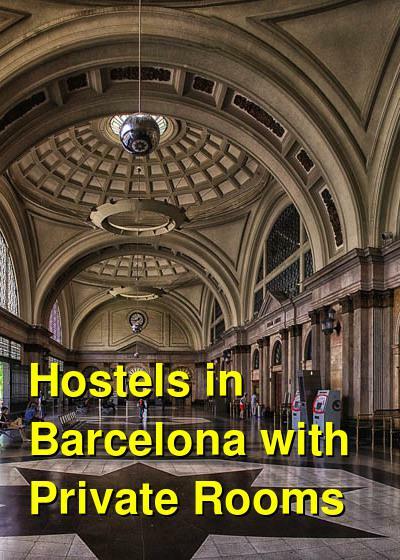 Hostel One Sants has mixed dorms 3, 4 and 6 people as well as twin private rooms. All the rooms are accessible by elevator. Toilets and showers are available on every level. They also have free internet access, as well as WiFi for your personal devices. There is no curfew, so you can come and go as you please. BCG is an attractive middle sized hostel located just 3 blocks away from Plaza Catalunya and 2 blocks from the Airport Train. It is a safe, friendly, clean and relaxing home away from home for genuine travelers and families in a vibrant and beautiful neighborhood of Barcelona. It is the perfect place to enjoy the city, with great opportunities to meet new people. They have a comfortable lounge and kitchen area that face onto a beautiful outdoor garden terrace. The staff are friendly and enthusiastic travelers who enjoy hosting social nights such us Flamenco or Tapas nights and helping to organize sightseeing activities. The hostel features a sunny outdoor terrace, great common areas, bright spacious rooms and comfortable mattresses. You will also find free computers, free WiFi, free lockers in shared dorms and free complimentary coffee and tea. Enjoy the hostel&apos;s fully equipped kitchen to cook your own meals. BCG also has a supermarket nearby, cable TV and DVDs, 24 hrs security surveillance and reception, a laundry service, free bedding and towels available for a small fee. Choose from double, twin, triple private rooms, with ensuite or shared bathrooms or mixed dorms of 5, 6 beds and female dorms for 4 people. Rodamon Barcelona is conveniently located in a beautifully renovated 20th century building in the centre of the city, close to Gaudi’s La Pedrera, Casa Batllo, high-end shops of Passeig de Gracia and right next to the beautiful gardens of Palau Robert. Rodamon Hostel is the place to be if you are looking for an authentic barcelonian experience. The hostel has a local, comfortable and homely atmosphere in one of the nicest locations in Barcelona. Everything is included, from comfortable beds to free lockers, linens, Wifi, large common areas with a fully equipped kitchen, relaxing area, laptops available, games and TV, plus an amazing terrace! The establishment hosts its guests both in spotlessly clean, smart-looking and comfortable private rooms as well as beautiful, modern minimalist decorated shared rooms, mixed or female, for 4 to 10 people. Each of the bunk beds has a power socket, personal light and dark curtains so you can have a comfortable sleep and enjoy your privacy while staying in a dorm.